Every, single, little, state. But it gets worse from there, because every state has different rules as to who actually needs to file a return, and what income tax actually needs to get paid. And by our count, NASCAR drivers, or rather, their accountants, have to know the tax code for 20 different states – Florida, Georgia, Nevada, Arizona, Virginia, Texas, Tennessee, Alabama, Kansas, North Carolina, Delaware, Pennsylvania, Missouri, Kentucky, New Hampshire, Indiana, New York, South Carolina, and Illinois, and Michigan. Possibly the biggest tax obstacle of the professional athlete is the potential requirement to file a separate state tax return for each state the taxpayer earns income. Each state has its own tax system and tax laws which may or may not require the taxpayer to file a tax return and pay that state’s income tax on the income earned while in the state. On the other hand, some states do not have an income tax (Texas and Florida, for example). Each player must generally pay tax in the state the income is earned. For example, if a Missouri resident plays a game in Wisconsin and receives game day pay, the player will owe income tax to Wisconsin on the earnings from that game — while all other income is not taxed in Wisconsin. In addition to the earnings in each state, a taxpayer generally must pay tax to his state of residency. Most states subject an individual to a tax on worldwide income if he/she is a resident of such state. Although, the state may grant tax credits or deductions for taxes paid to other states. Consequently, many professional athletes claim residency in Florida due to its lack of a state income tax. And if that’s not complicated enough, you’ve also got travel deductions, charitable deductions, complications based on whether or not they’re also a team owner and thus operating as a business, and a whole host of other regulatory gremlins from Mephistopheles himself. In 2013, Parker’s tax return was 252 pages. 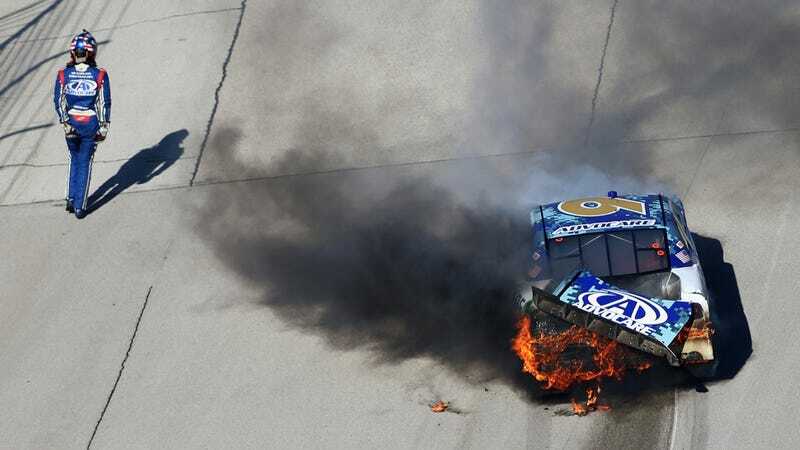 Safety in NASCAR is a big concern, but no one’s worrying about the biggest danger of all. Death, by drowning in the tax code. UPDATE: Apparently, "Michigan" is the name of a state where NASCAR races. I've never heard of this "Michigan" place, but I've updated the headline and the story to reflect its purported existence. H/t to Blake on the whole Michigan thing!